I’ve loved books for as long as I can remember. I even have a vague memory of playing library and “checking out” my books to my stuffed animals. So imagine my dismay when I saw that the historic Pioneer Book had closed their doors in downtown Provo. But fear not intrepid bibliophiles! They have re-opened on State street in Orem. Pioneer Book experimented briefly with a name change. 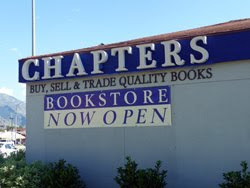 They are currently known as CHAPTERS, and that is the name you will see on the outside of their store…for now. The owner tells me that they will be reinstating the name Pioneer Book in the weeks ahead. Their reputation as the premier seller in Utah Valley of rare LDS titles is well established, and apparently many people like myself panicked when Pioneer Book appeared to have disappeared from the scene. 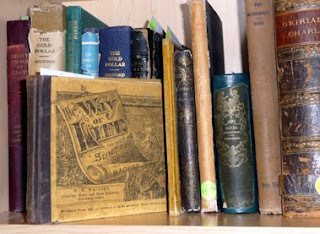 Pioneer buys, sells and trades books, which means they have a large inventory on a wide variety of subjects. Are you looking for the latest Barbara Kingsolver or Sophie Kinsella for book club? They’ve got it. 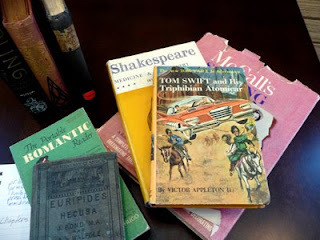 Tom Swift and his Triphibian Atomicar? Check. They’ve also got a wide array of college textbooks, the obligatory paperback section, and an impressive vintage collection. Allow yourself plenty of time to enjoy a good romp through the stacks. I found old friends like Nancy Drew and Mrs. Piggle Wiggle. I recognized classics I’d been forced to read in college, like Henry James. (Wings of the Dove was the only James I could stomach.) I saw topics I’d avoided in college, like Gregor Mendel and Heredity, and books I’ve been meaning to read, like Stephen Hawking’s A Brief History of Time. (At least I say I’ve been meaning to read it.) I even backed away nervously from Sigmund Freud’s Interpretation of Dreams. This week (Sept. 27-Oct. 3) all LDS and general religion books are 20% off. Did I mention that Pioneer Book specializes in rare and hard-to-find LDS titles? While at Pioneer Book, if you see me hunched over a dusty and venerable tome or huddled in a corner with a stack of Anne Perry paperbacks, say hello. It’s always nice to meet a fellow fanatic. You can follow Pioneer Book on Facebook and visit their blog at http://pioneerbook.blogspot.com/. Pumpkin Fest! 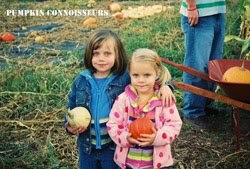 Wasatch Community Gardens Annual Event Is Here! Location: Historic Sandy Garden at 8880 S. 500 E.
Do you know your Mini Turk Turbans from your Long Island Cheese, or the difference between an Atlantic Giant and a Luminas? Neither do I, but I do know that the best place to get your Halloween pumpkin is at the annual Wasatch Community Garden Pumpkin Fest. I’m no expert in Cucurbitaceae. I tend to classify my pumpkins as “orange, green and white.” But at Pumpkin Fest, you’ll find gorgeous gourds in exotic varieties—all at practically half what you’ll pay at the grocery store. Smooth-skinned, red blush, mottled green, knobbly or veined, your unique pumpkin will make your porch the envy of the neighborhood. Pumpkin Fest is an ideal family activity. 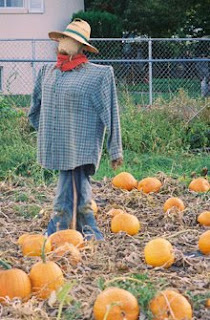 Kids can pick out their own pumpkins from the patch and get their faces painted. There is food and drink, live music and a variety of crafts (including some wicked Halloween Tie Dye). This event is on my “must list” every autumn. My advice is to go in the afternoon rather than the evening. Word has spread, and this annual fest gets a lot of visitors. Go in time to get the best pick of the patch.